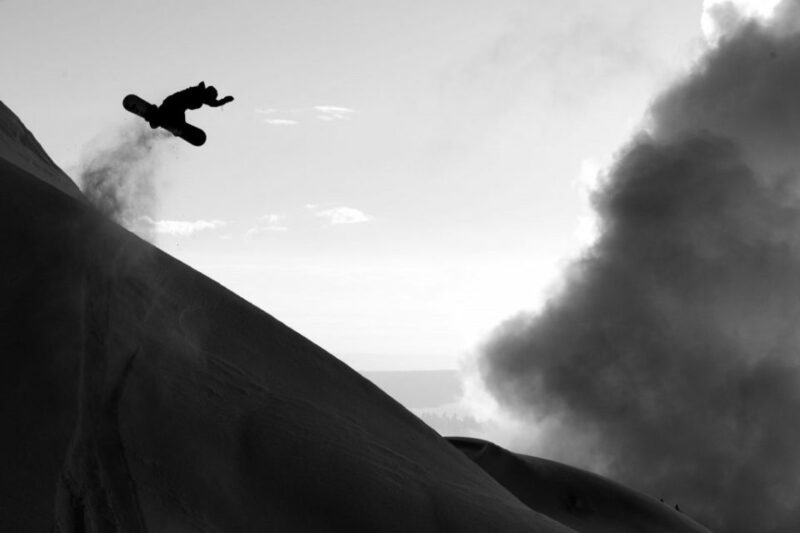 Nick Elliott and TJ Koskela love snowboarding. They wear it without pretense, putting passion on blast every time they drop in. That, together with their talent, makes these Dinosaurs Will Die teammates among the most watchable shreds in the game. Nick and TJ are coming off a big year of filming for the Dinos video, Dysfunctional Family, and lately they’ve been hyping a new project called Mount Mountain. From the sounds of it they’ve found a place where boarding is a little more authentic. This week’s TwoSix toasts creativity– scroll down to put one back with the realest. TJ: Yes. I’ve been up a couple times at the local hills, Grouse and Seymour. Grouse was all man made snow until this storm, but we’ve had a decent amount of snow out of it. Seymour’s open now with about a meter base, they had a park for opening day. It’s been sick. Nick: I’ve been up about a dozen days, jumping off a bunch of stuff already, testing the deepness of the storm. Staying safe, haven’t hit bottom too much and if I do it’s on the board. TJ Koskela. Evan Chandler-Soanes photo. Congratulations to both of you on Dysfunctional Family. Can you tell me about the project? TJ: Last year we got wind that Dinos wanted to do another team video. They made one four or five years ago that was pretty traditional, songs and parts, so we weren’t really sure if they were going to do it that way– we were just told loosely that they wanted us to start filming for a project. We went to Calgary and stayed at Lucio DM’s house. It was me, Lucio, Nick, Jeff Holce and of course Colter Heard– we did 10 days or so. After that we went to Williams Lake and spent a decent amount of time there, then went to Prince George and met up with Brad King. The rest of the filming, for our crew anyway, was mostly around here and at Seymour. Nick: That’s a great re-cap. For me personally, I’d never been part of a team video– it’s always been more friends, people on the same page kind of thing. But this was different, it was like ‘yeah, we’re the Dinos team.’ That was really cool, and I was super honoured to be a part of it. I’m really happy with how it turned out. There are so many people and so many different styles in the movie, Dysfunctional Family is a really fitting name. The montage style worked really well too, Brendon killed it. TJ: When I heard Brendon Hupp was going to be putting the movie together I got really stoked. I’m a huge fan of his– for those of you who don’t know, check out End Search. Nick Elliott. TJ Koskela photo. I’ve been seeing a lot of @mt.mtn references on Instagram– what is Mount Mountain? TJ: Well we’re missing our CEO, it’s Colter’s brainchild. Nick: We’re creating a boarder’s mountain. All the spots we hit, no matter where we are, are on Mount Mountain. It’s a boarder’s fantasy, kind of like a video game world. Mount Mountain is everywhere– it could be any resort in the world, the streets, the backcountry, it doesn’t matter. Whenever we’re finding spots and filming, we’re on Mount Mountain. TJ: It’s a place where we can be creative, and do everything that comes with that. Colter and Lucio have been putting together proposals for sponsors to help get Mount Mountain opened, but basically we just want to board without always tagging where we are and worrying about following rules or promoting some resort. Half Animal Chin, Half Out Cold? Nick: [laughs] Yeah, kind of! It’s still under the radar, because we don’t exactly know what it is yet. Our friends are all super creative, and what they end up doing and how Colter puts it together will be a big part of determining what it becomes. We all just want to snowboard with our friends at Mount Mountain spots. Jeff Holce, Nick Elliott, Lucio DM, Colter Heard. TJ Koskela photo. Speaking of creativity: TJ, you shoot a lot of film photos at sessions. Can you tell me about that? TJ: For me it’s been about documenting. Looking back on snowboard history and the people I looked up to growing up, I love seeing what they created during their time riding. It’s really cool to look through their stuff and be able to connect to the experiences. And taking photos myself lets me keep a physical piece of the times I’ve had with my friends, it gives me something I can look back on in 10 years and feel what the day was like. With film there’s always a cool moment when you get your photos back, a memory and a bit of surprise at how it turned out. The Dysfunctional Family movie poster was actually an accidental five exposure. I tried to take photos of Nick trying his trick, Nick after landing, and everyone looking at the clip on the camera. They all mashed into one exposure and it came out like a cool collage. How does the artwork and creativity of your friends inspire your boarding? Nick: Seeing them get creative, whether it’s filming, photography, whatever, inspires me to look at my snowboarding differently. They’re doing things in unique ways, maybe I can complement that with how I ride this spot. If Colter doesn’t think something is aesthetic, maybe I can hit it going uphill and make it work– stuff like that. I want to show people something new and refreshing. That doesn’t necessarily mean doing something crazy or forcing a weird idea to work, it can be simple stuff. Like TJ is super good at doing a simply trick but making it look really good, that inspires me too. Nick Elliott. TJ Kosela photo. TJ: Everyone has to see things in their own way. It’s important that everyone in the crew has their own look at the spot, thinks about how it will look on camera, try to think of new approaches. You might not be trying the hardest switch trick in the book, you could do something with a bit more style and grace to it and get a better result. And when everyone is contributing their perspective to the shot it’s more fun, for the filmers, for the riders, for everyone. Shoutouts to all the members of Mount Mountain– Colter Heard, Lucio DM, Tom O’Reilly, Adam Franks, Martyn Vachon, and Derek Molinski. Shoutouts to Sean Genovese, Jeff Keenan, Matt Heneghan, Russ Lee, Tyler Holm, Garret Louie, and Timebomb Trading, Dinosaurs Will Die, and Salmon Arms.